Foreword - from FIS President After four editions of World Snow Day, we are starting to see a positive impact on the snow sports. Independent reports are showing that snow sports participation is starting to rise again. Of course with this positive sign we should not sit back and say everything is solved. This is the time when we should make an even bigger push. The 4th edition of World Snow Day on 18th January 2015 was the largest to date. A record 645 Organisers in 45 countries staged brilliant events that brought children and their families together to celebrate all things snow. This laid a foundation for Organisers to engage people not normally associated with snow sports. One area in particular which is of great importance is schools. The actions of World Snow Day Organisers are one way to get children physically active and must be communicated to schools. The World Snow Day program makes this easy through the many digital and physical tools available to Organisers for free. The World Snow Day partners Audi, Sanetta, Eurosport, the European Broadcasting Union, Infront Sports & Media and The World Federation of the Sporting Goods industry (WFSGI), The European Federation of the Sporting Goods Industry (FESI) and Best of the Alps have made an outstanding contribution to this event. I would like to take a moment to thank them for their motivation and eagerness to bring children to the snow. The future for World Snow Day and the overall Bring Children to the Snow Campaign is brighter than ever. For Organisers thinking for joining the World Snow Day family this is the time. For World Snow Day Organisers not sure of their future participation we encourage you continue with World Snow Day, your actions are making a difference. 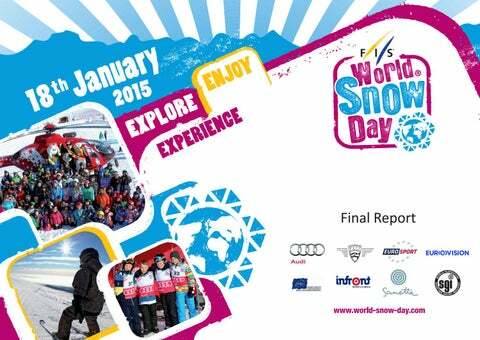 Acknowledgements The FIS World Snow Day 2015 Final Report would not have been possible without the support of the Event Organisers and the contributions of hundreds of participants whose feedback has been invaluable. Thanks are also due to the FIS Member National Ski Associations and all partners and sponsors for their continued support. The 4th edition of World Snow Day took place on 18th January 2015 with just over 591â&#x20AC;&#x2122;200 participants exploring, enjoying and experiencing snow at 645 events in 45 countries. Children and families enjoyed free or discounted ski and snowboard lessons, lift passes, ski equipment, as well as concerts, races, gifts and prizes, to name just a few of the hundreds of activities. Events took place in cities, on high mountain peaks and everywhere in between. Event Organisers included ski and snowboard resorts, National Ski Associations, private event companies, ski and snowboard clubs, ski and snowboard schools, manufacturers and retailers. The majority of World Snow Day Organisers and participants have expressed a strong interest in participating in the 5th edition of World Snow Day, which will take place on 17th January 2016. 2 The setting for World Snow Day in Aletsch Arena (SUI). Stunning. Who is the International Ski Federation (FIS) ? As the governing body of international skiing and snowboarding, FIS manages the Olympic disciplines of Alpine Skiing, Cross-Country Skiing, Ski Jumping, Nordic Combined, Freestyle Skiing and Snowboarding, including setting the international competition rules. Through its 123 member nations, more than 7’000 FIS ski and snowboard competitions are staged annually. Specific initiatives are undertaken by FIS to promote snow activities as a healthy leisure recreation, notably for the young. What is World Snow Day ? World Snow Day was launched in 2012 and looks beyond the FIS membership to the wider snow sports community. It seeks to encourage the snow industry stakeholders to be part of activities for children aged from 4-14 to celebrate all things snow. In short, World Snow Day is designed to be the biggest day on snow all year and will be staged annually for years to come. This report summarises the key facts and figures from the 3rd edition of World Snow Day which took place on 19th January 2014. World Snow Day Goals and Analysis Primary Goals: Goal: Enable children and families to Explore, Enjoy and Experience snow through special events and activities organised as part of World Snow Day. Measure: To average 500 events in 40 countries by the sixth year of operation. Status: With 645 event in 45 countries for the 4th edition of World Snow Day, the program is on track to achieve this goal. Goal: Create global momentum for a great future of organising snow activities Measure: The goal is 800,000 individual participants by the sixth year. This is a 100,000 increase annually. Status: This yearâ&#x20AC;&#x2122;s event fell just short of the 100,000 increase annually. World Snow Day has identified opportunities within its communication to reverse the situation. Secondary Goals: Goal: Increase awareness about the need to protect and conserve the natural environment. Measure: To have 20 events with environmental activities inside their event program. Status: Following the 4th edition of World Snow Day 22 events contained environmental actions. Goal: Emphasise the importance of snow safety and awareness of rules of conduct. Measure: To have 20 events with safety activities inside their event program. Status: A total 42 events had safety activities as a part of their event program. 3 Events in the Southern Hemisphere. and Media, Eurosport, Sanetta, Best of the Alps, WFSGI and FESI. 12 Events designed to benefit disadvantaged youth and children. 13 events in major cities. More than 120 resorts with free skiing and snowboarding. 142 events in one country. 1’885 World Snow Day events over three editions. Estimated 48’943 minutes watched on YouTube. More than 63’607 YouTube video views. More than 591’200 participants in the 4th Edition of World Snow Day! World Snow Day by Continent and Country The 4th Edition of World Snow Day saw 645 events organised in 45 countries. Types of Organisers World Snow Day Events were staged once again by a wide array of Organisers. The most common were National Ski Associations, with 329 events, representing 51%. This is a 14% increase for National Ski Associations in comparison to last year. Other notable increases came from Event Organising Companies and Ski and Snowboard Schools. It is very positive to see a wider variety of Organisers in comparison to the 3rd edition of World Snow Day. Example Events Throughout Sweden: Everyone on snow. 22 ski resorts with free lessons, games and discounted lift passes. Lake Louise, Canada: Free Skiing and Snowboarding for children. Himchal Pradesh, India: Environmental day for kids. Whistler, Canada: Childrenâ&#x20AC;&#x2122;s Ski Cross race. Cortina dâ&#x20AC;&#x2122;Ampezzo, Italy: Kids day with the athletes. Throughout Latvia: Celebrations with games, free lessons and demonstrations. Throughout Norway: 103 ski resorts with free skiing and snowboarding. Throughout China: 15 ski resorts with free skiing and snowboarding for children as well as live entertainment. Throughout Russia: 35 locations hosting a multitude of actions including free ski lessons, discounted lift passes and snow games. Throughout Poland: Free ski and snowboard lessons throughout the country. Johannesburg, South Africa: Free indoor ski lessons. Wengen, Switzerland: Free lift passes for children. Boreal, USA: Free skiing and snowboarding for children. (21.06.2014) Release of the Audi World Snow Day Toolkits (19.01.2014) Completion of the 3rd edition of World Snow Day. 610 Organisers, 35 countries. (18.01.2015) 4th Edition of World Snow Day celebrated by 645 Organisers in 45 countries! (01.11.2014) 3 year partnership agreement with Infront Sports & Media and EBU reached. 5th Edition of World Snow Day announced to take place on 17th January 2016. (01.01.2015) Virtual World Snow Day launched on all FIS websites. (19.01.2015) Reporting system for World Snow Day launched. (20.02.2015) Reporting system closes for World Snow Day. To communicate World Snow Day, FIS engaged in numerous international promotional and communication activities. Local communication and promotion activities were created by National Ski Associations and Event Organisers. Presence at FIS World Cup Events Similar to last year, from 26th December â&#x20AC;&#x201C; 18th January 2015, the World Snow Day brand was featured on the starting bibs of all competitors in FIS World Cup events. With many thanks to World Cup Organisers and National Ski Associations, the World Snow Day promotional trailer was shown onsite at races. Additionally the World Snow Day snowball was displayed by athletes during World Cups. World Snow Day on TV From 1st December 2014, the fourth official World Snow Day promotional TV spot was made available in six languages (English, French, German, Italian, Spanish and Russian). Thanks to partnerships with Eurosport, EBU and Infront Sports and Media the spot was distributed globally. Broadcasters successfully integrated the spot into programming from the 28th December â&#x20AC;&#x201C; 18th January 2015. World Snow Day hit the international headlines. (LEFT) Article in the Huffuington Post and (RIGHT) International Olympic Comittee front page. Media Events Press releases and other information were regularly provided to the media. All official World Snow Day press releases are also available on the World Snow Day website at: http://world-snow-day.com/en/Info/Media. This resulted in many articles getting published on global platforms, including the International Olympic Committee website, British Daily Telegraph, BBC and Huffington Post. Social Media World Snow Dayâ&#x20AC;&#x2122;s social media presence has seen excellent growth. Presence increased on all platforms as well as the new platform Instagram. Moreover, Organisers also embraced social media. Facebook pages, Facebook event pages, Instagram accounts were all established. This and videos all increased the communication of the event. 17 US Nordic Combined athlete Taylor Fletcher with the World Snow Day Snowball. Website www.world-snow-day.com is the official website for World Snow Day. In addition to releasing all related news and information, the website provides each registered Organiser with a dedicated page to promote their events and partners. To help develop the World Snow Day identity, registered Organisers have access to a free online toolkit with templates for banners, flags, souvenirs, diplomas and other promotional items. The WSD official website is cross-linked and promoted by all official FIS websites, pages and communication platforms. Integration in FIS channels FIS continuously publishes World Snow Day news on www.fis-ski.com and discipline websites. News was pushed further through the FIS Newsflash. A designated section within the Newsflash titled “Bring Children to the Snow Corner” gave additional promotional benefit. The 11th FIS Youth and Children’s Seminar was held in Zurich, Switzerland, on the 2nd October 2014. The title of the seminar was “Recruiting and Retaining”. Continuing on from the previous years, international and national organisations were invited to present their efforts to bring children to sports. The Seminar also provided a platform for Nation Ski Associations to present their successes in activating the youth. The Youth and Children’s Seminars have continued to grow in attendance with the 12th edition boasting the participation of more than 120 delegates (30% increase from last year) from over 55 National Ski Associations (33% increase on last year). Partner Actions The 4th Edition of World Snow Day was supported by eight exceptional partners: Audi, Sanetta, Eurosport, European Broadcasting Union, Infront Sports & Media, Best of the Alps, WFSGI and FESI. The potential of World Snow Day has been substantially enhanced by these partnersâ&#x20AC;&#x2122; excellent participation and cooperation. From 19th January to 28th February 2015, World Snow Day Organisers submitted event reports in the form of text, photos and videos through the World Snow Day Live Profile system. The individual 2015 World Snow Day event reports can be viewed here www.world-snow-day.com/en/WSD/Reports/2015 . During this period, an online survey was conducted to collect feedback anonymously from the public who attended a World Snow Day event and also those who could not. Feedback from Event Organisers Types of World Snow Day events According to the data collected, the most popular promotion offered was free ski and snowboard passes (25.11%). The top five offers from the 3rd World Snow Day were a combination of discounted and free offers. While in 2015, the top five actions were all completely free of charge. This shows a clear intention from Organisers to make snow sports more accessible. Do you feel the World Snow Day brand helped you attract participants? 75.7% of Organisers said the World Snow Day brand was ‘Very helpful’ in attracting participants. This is a 36.1% increase on the previous year. Do you feel the World Snow Day brand helped attract media attention? 58.6% of World Snow Day Organisers said the World Snow Day brand was ‘Very helpful’ in attracting local media attention. An additional 28.6% said the brand was helpful to some degree. Combined, 87.2% of Organisers said the brand was helpful in attracting media attention. This is 10.1% increase on the previous year. Do you feel the World Snow Day brand helped attract sponsors and partners? 87.1% or World Snow Day Organisers said the World Snow Day brand provided some degree of assistance in attracting sponsors and partners. This is a 3.7% increase on the last edition of World Snow Day. Do you feel the World Snow Day brand helped motivate your team? 67.1% of World Snow Day Organisers said the World Snow Day brand was very helpful in motivating their team. Do you plan to Organise an event for the next edition of World Snow Day (17th January 2016)? 84.3% of World Snow Day Organisers stated they will participate in the 5th edition of World Snow Day. Moreover, an additional 11.4% of World Snow Day Organisers stated that there is a good chance they will participate. Combined this shows 95.7% of Organisers aim to stage an event for next year. This is a 6.1% increase. Feedback from World Snow Day Participants How much did you enjoy your World Snow Day event? From the information obtained, 100% of people who were able to attend a World Snow Day event thoroughly enjoyed themselves. This is a positive increase of 15% on the previous year. How did you hear about World Snow Day? 66.7% said that they were informed about World Snow Day through their local event Organiser. While 64.2% of participants said they heard about the event on television and 43% on social media. This yearâ&#x20AC;&#x2122;s numbers showed an even distribution of platforms where people heard about World Snow Day. This highlights the importance that communication should be present in traditional media as well as new media such as Facebook, Twitter, Instagram. What interests you about World Snow Day? ‘Activities on snow’ and ‘Gathering with family and friends’ remained the top attractions of World Snow Day events. ‘Free or discounted offers’ also saw increased interest from the public. Which special offers attracted you to the events? ‘Activities on snow’ and ‘Gathering with family and friends’ remained the top attractions of World Snow Day events. ‘Free or discounted offers’ also saw increased interest from the public. Do you plan to participate in the next edition of World Snow Day (17th January 2016)? 86% of participants in World Snow Day events plan to participate in the 5th edition of World Snow Day (17th January 2016). This underscores that World Snow Day events were fun and successful. “ Thank you for the great initiative, our kids loved the events ” No snow? No issue for World Snow Day Organisers in Peru. Feedback from Non-Participants How did you hear about World Snow Day? 78.4% non-participants said that they heard about World Snow Day through social media. Only 5.6% of non-participants heard about World Snow Day through television. When compared with the statistics from people who did participate it is revealed that television has a good conversion rate. This signifies that the World Snow Day promotional trailer is one of the best forms of communication. Why could you not participate in the 4th Edition of World Snow Day? Feedback from non-participants revealed that the majority of people who could not attend a World Snow Day event was due to other obligations. Interestingly out of the 453 respondents not one mentioned that snow sports are too expensive. Which activities or promotions would help you to participate in snow sports more? Non-participants indicated that ‘Free/discounted lessons’ would be the best promotion to motivate them to participate in snow sports. ‘Free/discounted lift passes’ and ‘Free/discounted events’ rounded out the top three responses. Do you think you might participate in the next edition of World Snow Day (17th January 2016)? According to the surveys conducted with the public, it was a positive sign that 73% of the persons who did not participate in the 4th edition of World Snow Day would participate in the next edition. This is an increase of 30.1% . Based on information and feedback, FIS has compiled a list of suggestions for future World Snow Day Organisers. Local Communication is key It is clear that promotion on a local level is a key to attracting participants. 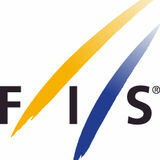 FIS drives the international communication, but it is up to Organisers to communicate locally. FIS encourages all Organisers to access the World Snow Day Toolkit and utilise the promotional Tools. Templates for posters, stickers and postcards are free to download and can be modified to meet your needs. Approaching local schools and sporting clubs to invite them to the event is also a great way to drive participation. Be sure to have your activities well defined and always invite them back the next year. Hint: Click here to access the World Snow Day Toolkit for all your local communication needs. Utilize social media The World Snow Day social media platforms are free to use and can have large reach. World Snow Day recommends a good starting point to be Facebook, Twitter and Youtube. It is important that if you use these platforms to make regular updates. Hint: A Facebook event page for an Organisers World Snow Day is a great idea. Get your event signed up early Early registration of an event allows for better exposure. Early communication of your event allows potential participants to plan ahead. Additionally early registration also increases media attention. Finally FIS will also be able to present events to interested partners, with September and October being the ideal time. Hint: Registration opens the 1st July 2015. Maximize World Snow Day partnerships World Snow Day continues to create strong partnerships. The recent agreement with Audi has seen the development of Toolkits for Organisers to help stage events. These Toolkits are free of charge, will be delivered to the Organisers location and become the property of the Organiser after the event. Hint: Stay tuned to the home page of World Snow Day for offers for Organisers. Emails will also be sent to Organisers when a new offer arrives. Decorate the atmosphere with World Snow Day branding Given the increasing global awareness of World Snow Day, it helps to leverage the identity for an event. Good examples from World Snow Day 2015 included creative use of banners, flags, race bibs, face tattoos, skis, hats, shirts, mascots, and so forth. Many designs and templates for the items listed can be accessed through the online World Snow Day toolkit. Templates are free of charge once registered. Hint: Click here to access the digital World Snow Day Toolkit. The 4th World Snow Day has once again exceeded all expectations. Breaking last year’s record of 610 events, World Snow Day has now provided more than 1.7 million participants the opportunity to explore, enjoy and experience snow. The impact from these events is felt worldwide and is making a tremendous contribution to the snow sports community. What’s more not only are Organisers securing the future of snow sports, but they are providing children the simple joy of happiness and fun. These memories will last with participants a life time and are sure to be passed onto the next generation. As World Snow Day looks to the future, the target of 800’000 participants is goal which can be reached. With thanks to the dedication of Organisers, support of all stakeholders in the snow sports industry and families this great initiative is truly bringing children to the snow. See you for the 5th Edition of World Snow Day on 17th January 2016! 48 Join the kids of Everyone on Snow and Sweden for the next World Snow Day!